"Panda" redirects here. For other uses, see Panda (disambiguation). A giant panda at the Smithsonian National Zoological Park in Washington, D.C. The giant panda, Ailuropoda melanoleuca, is a b China. Although it belongs to the order Carnivora, the panda's diet is 99% bamboo. Pandas in the wild occasionally eat other grasses, wild tubers, or even meat in the form of birds, rodents or carrion. In captivity, they may get honey, eggs, fish, yams, shrub leaves, oranges, or bananas along with specially prepared food. Giant pandas lives in a few mountain ranges in central China, mainly in Sichuan province, but also in the Shaanxi and Gansu provinces. As a result of farming, deforestation and other development, the panda has been driven out of the lowland areas where it once lived. Giant pandas are about the size of an American black bear. They are about 3 feet (91 cm) tall at the shoulder when they are standing on all four legs. They are about 6 ft (180 cm) long. Males weigh up to 251 pounds (114 kg) in the wild. Females usually weigh less than 220 pounds (100 kg). 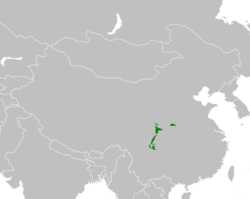 Wild giant pandas have lived in the mountains of central China. They live in forests of tall trees. They eat the bamboo that grows under the trees. The weather is rainy and misty in these mountain forests. There are thick clouds almost all the time. Bamboo is the main diet of panda . Ninety-nine percent of the food they eat is bamboo. They eat as much as 40 pounds (18 kg) of bamboo every day. They spend 10 to 16 hours every day looking for food and eating it. 15 cities outside China have zoos with giant pandas. ↑ 1.0 1.1 1.2 1.3 1.4 "Ailuropoda melanoleuca". iucn. Retrieved 2013-10-18. ↑ 6.0 6.1 6.2 6.3 6.4 6.5 "Giant Pandas". Smithsonian National Zoological Park. Retrieved 2013-10-18. ↑ Hammond, Paula (2010). The Atlas of Endangered Animals: Wildlife Under Threat Around the World. Marshall Cavendish. p. 58. ISBN 0761478728. ↑ "Giant Panda, symbol of China, shed happiness at the world's zoos". People's daily onlnine, English version. Retrieved 3 May 2008. ↑ "Panda message make foreigners more aware of China". Chinaview.cn. Retrieved 3 May 2008. ↑ "The Giant Panda". Katherine Kennedy. Retrieved 3 May 2008. ↑ Earth's Changing Environment. Learn & Explore. Encyclopaedia Britannica, Inc. 2010. p. 49. ISBN 1615353399. ↑ Watson, DA. "The Panda Lady: Ruth Harkness (Part 1)". Female explorers. Retrieved 1 February 2007. ↑ "China's Panda Diplomacy". Time. Retrieved 2 May 2008. ↑ 14.0 14.1 14.2 14.3 14.4 "On this page you can find information about the giant pandas who live outside of China". GiantPandaZoo. Retrieved 9 August 2010. ↑ "Zoologischer Garten Berlin". GiantPandaZoo. Retrieved 9 August 2010. ↑ Oleksyn, Veronika (23 August 2007). "Panda gives surprise birth in Austria". AP via Yahoo! News. Retrieved 24 August 2007. ↑ "Pandas sent off to Spain". Retrieved 5 May 2009. ↑ Casey, Michael (28 May 2009). "China experts say Thailand's panda cub healthy". Associated Press. ↑ "Giant panda pair headed for Tokyo zoo". Retrieved 2011-05-04. ↑ "Kobe Oji Zoo". GiantPandaZoo. Retrieved 9 August 2010. ↑ "Panda Zoos List". www.GiantPandaZoo.com. Retrieved 2011-05-05. ↑ "Panda World". Retrieved 17 September 2016. ↑ "Rudd gives panda pledge". ABC. 11 April 2008. Retrieved 3 May 2008. 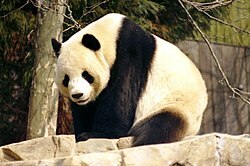 Wikimedia Commons has media related to Giant Panda. Wikispecies has information on: Ailuropoda melanoleuca.